The 65th Annual report includes details of the Committee of Management and Honorary Governors . Reports from the President, Matron of the After-Care Hospital, Matron of MDNS, the Social Service Officer and Honorary Obstetricians. There are also financial, Auxiliary and donor reports. Centre pages contain black and white photos for the After-Care Hospital. MDNS published annual reports from 1885. The reports document the people, social conditions, events and achievements of the Society from that time. Black and white photograph Matron Dorothy Tupper standing beside 3 district nurses who are seated in the grounds of the Aftercare Hospital. 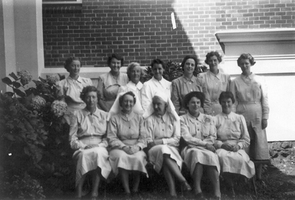 In 1941 Miss D. Tupper was appointed Matron of the Melbourne District Nursing Society. She held this position until she retired at the end of 1962. In 1929 Melbourne District Nursing Society formed a volunteer Motor Auxiliary to transport their nurses to make visits to clients who lived a distance away. 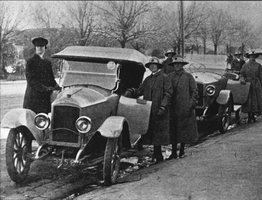 At first wealthy people offered their car and chauffeur, but then the general public supplied their own vehicles. They operated on week days and gave a half day a month or fortnight or weekly if able. They could take up to three nurses at a time and collected them from the Nurses Home, 39 Victoria Parade, Collingwood, at 9 a.m. They did the rounds dropping each nurse at a client then picking them up and taking them to the next client before completing the morning round and returning to the Nurses Home at 1 p.m.. The nurses were able to double the number of visits they did each morning and did their afternoon visits on public transport. At its peak there were 60 volunteers but this fell off during World War 2. In 1944 the Red Cross were assisting, and by 1953 were taking out 16 nurses. Appeals for volunteers occurred over the years, particularly during the Tram and Tramway Bus strike in the 1950s, and when the Royal Women's Hospital had an influx of births and wanted to send the mothers and babies home on day four but could not do so if M.D.N.S. could not visit. During 1962 the Motor Auxiliary transported 34 nurses who preferred not to drive themselves, but as M.D.N.S. own fleet grew there was less need for their service and the Auxiliary was disbanded in 1971. 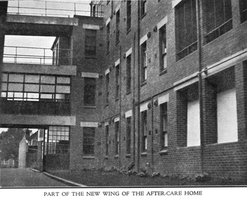 Black and white digital image taken of the rear of the MDNS After-Care Hospital showing part of the new wing..
Melbourne District Nursing society opened the After-Care Home, situated at 39 Victoria Parade Collingwood in 1926 following a public appeal for funds. The After-Care Home was originally established to provide nurse-managed convalescent care to poor and underprivileged people who could not look after themselves at home due to illness or on release from hospital. Opening in 1926, at a cost of £27,000, the home included maternity, children’s and adult wards as well as accommodation for Matron, 12 nurses and 4 domestic staff. In 1931 an ante-natal clinic was opened at the home. During 1934 the Women’s Welfare Clinic including, at the time, a very controversial Family Planning Clinic, the first of its kind in Australia, was opened to support women at risk following multiple and difficult pregnancies. Major extensions in 1936 led to the After-Care Home becoming The After-Care Hospital. Following Government intervention, the After-Care Hospital was separated from the Melbourne District Nursing Society in 1957. Melbourne District Nursing Society became the Melbourne District Nursing Service and moved to 452 St Kilda Rd. The After-care hospital continued to operate at the same address until 1985 when it became the Melbourne Geriatric Centre. 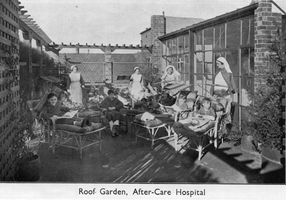 Digital Image showing two nurses and two sisters supervising convalescing children in the roof garden of the After-Care Hospital . 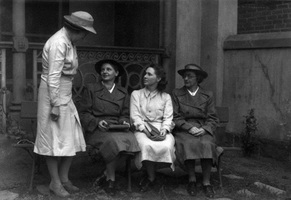 Digital Image showing Matron Lee-Archer wearing a long white uniform and veil, and a Melbourne District Nursing Society trained nurse wearing a long grey uniform with white collar and cuffs, and wearing a white pith helmet with red cross - helmet held on by a veil. They are about to leave MDNS Nurses Home at No. 5 Royal Terrace, Nicholson Street, Fitzroy. They are standing by their bicycles; one has a nursing bag attached to the handlebars. The Melbourne District Nursing Society (M.D.N.S.) moved into larger premises at No. 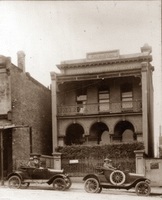 5 Royal Terrace, Nicholson Street, Fitzroy in May 1904. This establishment was their Head Office as well as the Nurses Home. Matron Lee-Archer and five trained nurses were employed by M.D.N.S. at that time to visit and attend to patients in their own homes. Melbourne District Nursing Society - For Nursing The Sick Poor In Their Own Homes. The Ante-Natal Clinic at the After-Care Hospital, Victoria Parade, Collingwood, was opened on the 23rd of September 1930 and M.D.N.S. Midwifery clients were encouraged to attend. Prior to the opening of the clinic ante-natal care was not considered important, but within a short time 100 percent of MD.N.S. Midwifery clients were attending. . During 1934 the Women’s Welfare Clinic including, at the time, a very controversial Family Planning Clinic, the first of its kind in Australia, was opened to support women at risk following multiple and difficult pregnancies. Black and white photograph of Sr. Mary Gawith - Nurse Educator (left), pointing to the map on Heidelberg Centre's office wall. This map showed the areas covered by Heidelberg Centre staff. The three staff observers are from L) to R) Sr D. Geldard, Sr B. Armstrong, Sr E. Francis. Centre orientation was offered to all new staff. Barry Sutton photographer's stamp, quote number KY 40, names of staff in the photograph. Black and white photograph of Miss Kosch (private physiotherapist standing rear left), Sr Daphne Geldard seated in chair, Sr Elizabeth Francis preparing to assist Sr Geldard out of the chair, Sr Beverley Armstrong standing at rear right. Photo was taken at Heidelberg Centre. Education on safe lifting and transfer techniques were offered to all nursing staff. Private physiotherapists were contracted until RDNS were able to employ their own physiotherapy staff. 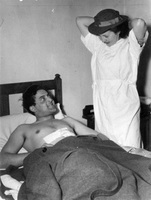 Black and white photograph of Ms Kosch ( physiotherapist in private practice ) educating nursing staff in safe bed mobility techniques. Left to Right are Sr E.Francis, Sr B.Armstrong, Sr D. Geldard, Ms Kosch. This educational took place at Heidelberg Centre. A public appeal was made to raise funds for Melbourne District Nursing Society so motor cars could be purchased to assist nurses with their visits during the Influenza epidemic of 1919. With donations from businesses and individuals three cars were available with in a month. This black and white photo is of nurses receiving education at the Royal District Nursing Service Head Office. The group was part of the Post Basic Community Nursing Course and the teacher is Sr. Paddy Rowley. Sister Margaret Affleck is sitting at the right hand side desk. Melbourne District Nursing Service ran its first Post-Basic Course for community nurses in 1962. Nurses attended the course for 12 months. The course ran annually until the mid 1990's. Black and white digital image of nurse and 3 children in the Marion Boothby Ward of the Melbourne District Nursing Society After Care Home. Image was scanned from the MDNS 1930 annual report. The Marion Boothby Ward at the After Care Home opened in 1930. Named in honour of Mrs Noel Boothby, Life Governor and generous supporter of the Society who passed away in 1929. The photograph portrays a registered nurse holding a young child viewing the newly completed mural by Miss Jessie Traill. Two young children in cane wicker trolley look on.The photograph appeared in the MDNS Annual Report of 1931. Nurses wearing long grey coats and white pith helmets, which display a red cross.Pith helmets are held on with a white veil. 2 Bicycles with nursing bags attached to handlebars. 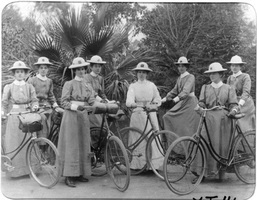 Nurses - Back - L-R - O'Sullivan, Deans, Warren, Amess, Pat Lee and Jane with bicycle Front - L-R - Blanche Wilson, Matron Freeman, Peake and Brown. By the end of the 1960s there was an increased focus on rehabilitation and independence, patients were offered rehabilitation and new lifting techniques were introduced to reduce physical strain on staff. Royal District Nursing Service ran its own rehabilitation program requiring staff to be trained in techniques by RDNS Physiotherapists. Photograph showing Educator Paddy Rowley conducting inservice education to Royal District Nursing Service (RDNS) staff on March 25 1974. Named staff Ann Greenwood, Judy Peter, Ethel Fullarton, Barbara Lovell, Shirley Lewis. RDNS was a leader in Inservice Education and established its own Department of Community Nursing Education in 1962. Melbourne District Nursing Society (MDNS) was established in 1885 to care for the sick poor in their own homes in the slums of inner Melbourne. Original founders included Reverend Charles Strong, Lady Janet Clarke and members of the Caffyn family. Lucy Smith was the first Florence Nightingale trained nurse employed by Melbourne District Nursing Society. She worked with MDNS between April 1892 - June 1893 when she left to get married.